Anyone who knows me or my tastes know that I more often frequent the vineyards of the US west coast than South America or Europe. When straying from this path, however, I’m often pleased–whether sampling a power-packed Bordeaux or, in this case, a delicious Montepulciano from the Abruzzo region of Italy. This my mother opened as part of a fun Mother’s Day celebration. It started us off while we sampled bacon-wrapped scallops, mini-crab cakes, and other sundry treats, and it stayed with us (me in particular) during dinner and dessert. 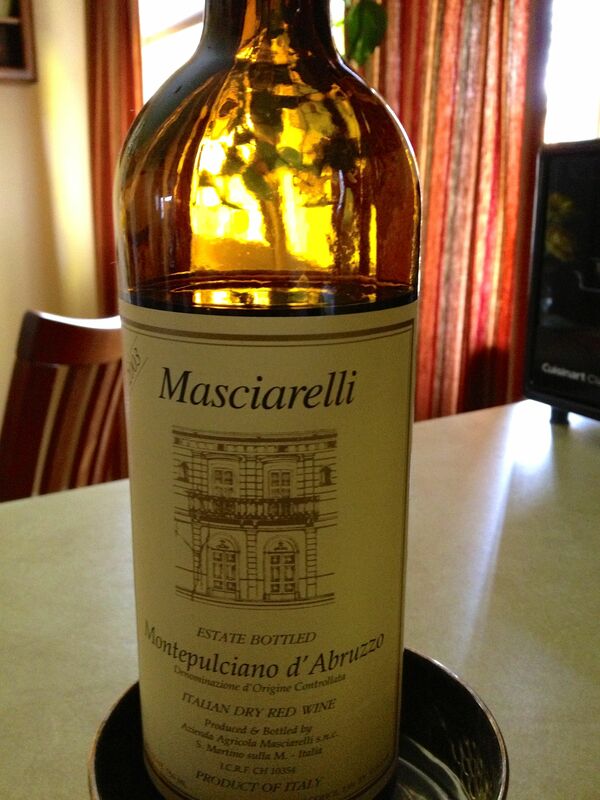 2010 Masciarelli Montepulciano de’Abruzzo, Italy. The Masciarelli was paired with broiled swordfish, covered in a grape jelly and barbecue sauce, and grilled asparagus and risotto. Not quite the way you’d draw up the game plan for a soft red, but it seemed to go well–as demonstrated by the empty bottle at the evening’s end. It is supposed to be “one of Italy’s most famous wines…a classic, well-rounded, plumb-scented Italian red made from Montepulciano grapes grown in the Abruzzo region on Italy’s Adriatic coast.” That description carries with it an ethereal quality that I think I found in the wine itself. Great to celebrate the occasion with my mother and such an adventurous bit of vino. Not soon to forget either!